Some global parameters apply to your entire Webasyst account rather than to its individual app or section. To change such parameters, use the Settings app. Below are described each of its sections. Company name. This value may be displayed on your website pages and may also be added to email and text (SMS) notifications as a part of the signature. If you have several websites set up, then the same company name will be used for all of them. Website address. This URL may be used on website pages and in notifications. The same URL is used for all websites set up within one backend. Localization engine. Webasyst is capable of displaying translated text strings using 2 methods—by means of Gettext or PHP functions. The Gettext option works faster so you would better prefer it over the other one. On some servers Gettext may not work, so you can switch to PHP localization option. Clear cache. Webasyst saves some pre-calculated values in temporary files to avoid their re-calculation too often when it is not necessary. This way better server performance is ensured. Such saved pre-calculated values are called cache. It might happen so that Webasyst may fail to delete outdated cache files, which may result in errors in its operation. Whenever you encounter unusual or faulty behavior of a Webasyst app, try to clear cache in this section. Doing so may briefly slow down Webasyst but will also delete outdated cache files, which will immediately be replaced by correctly formed ones. For developers (developer mode). This option must be disabled during everyday operation. When it’s disabled, cache is regularly saved and your website works faster. With the developer mode enabled, cache is not saved, which is useful during software development or for debugging purposes. 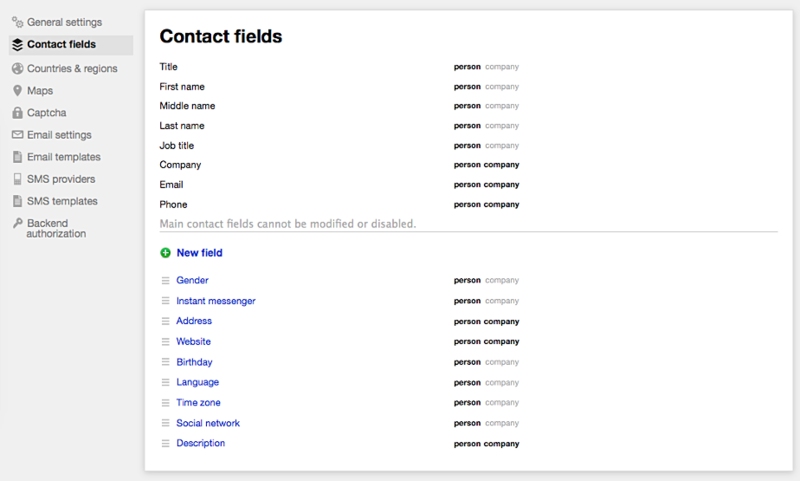 In this section you can manage fields in which to save properties of your contacts, i.e. backend users and your clients. You can add new fields and rename some of default ones. All fields set up in this section are available during the editing of user and customer profiles in Webasyst backend; e.g., via CRM or Team apps. Custom contact fields can also be used for changing online store checkout settings in Shop-Script app. The “Address” field is special. When you try to edit it, you will see a set of sub-fields. You may try custom sub-fields to save addresses; e.g., for entering a subway station name. Any country or region can be added to the favorite list using the star icon. Favorite countries and regions are duplicated at the beginning of a country or region list whenever a user is offered to select them. This is helpful for faster selection of items from long lists, especially if your business geography is rather local than global. Webasyst apps can use an online maps service to show locations on a map—either their own or the one selected in Webasyst system settings. Select the type of captcha (read on Wikipedia) to be used in your account—default Webasyst captcha or Google reCAPTCHA. To use the captcha by Google, you must have an account in its service. Email address for notifications. 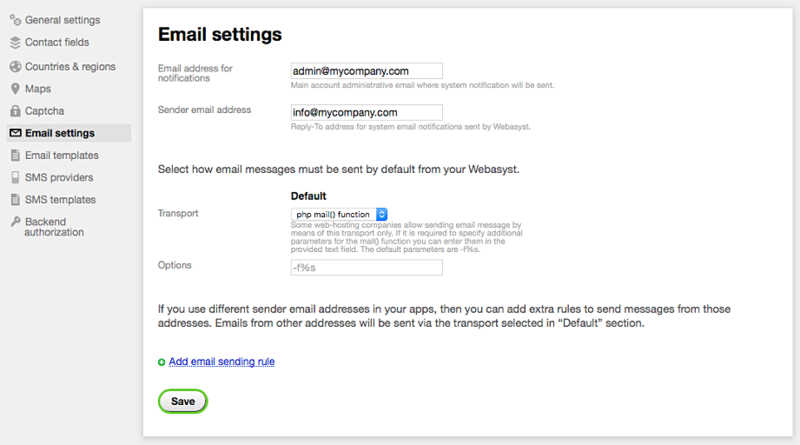 Webasyst can send you email notifications about the operation of your account. Save here an email address which you are regularly checking for new mail. Keep looking in the “Spam” folder in your mailbox to avoid missing important notifications. Sender email address. System email notifications are sent from this address; e.g., password recovery notifications. Keep in mind that your clients may try to reply to such notifications, and their replies will be sent to this sender address. Transport. Select a preferred email sending method. The simplest option is usually PHP function mail(). This email sending transport usually works o most web servers. Should it not work with you, change default parameters in the “Options” field for mail() function or select another transport—system function sendmail or SMTP connection. on one-time authorization code request. If you have several websites set up, you may add more notification template groups and use each of them for different sites. Then select an appropriate group in Site app’s authorization settings. Here you can connect your Webasyst to SMS message providers. This section lists settings fields provided by all SMS plugins that you have installed. If you have no such plugins installed or none of them is set up, no SMS messages will be sent from your Webasyst account. Configure how backend users must log into your Webasyst backend. Password type: whether users can log in with their permanent passwords or must enter unique one-time codes to be generated and send to them by email or SMS each time they need to log in. Re-sending of verification code: specify a timeout in seconds upon which a user will be able to request the re-sending of a one-time authorization code. User notifications: selection by which transport users will receive authorization-related notifications—either by email or in SMS, or in both ways. Login form: set up how the login form should appear for backend users. Captcha: whether a user must enter a protection code from a generated image—for greater backend security; you can select the type of protection images in Settings app’s “Captcha” section. Auto-login: this option is useful for fast authorization when a user always works on the same computer. Browser cookies with a user’s authorization data will allow them to skip entering a password if they have once selected the “Remember me” option during login. 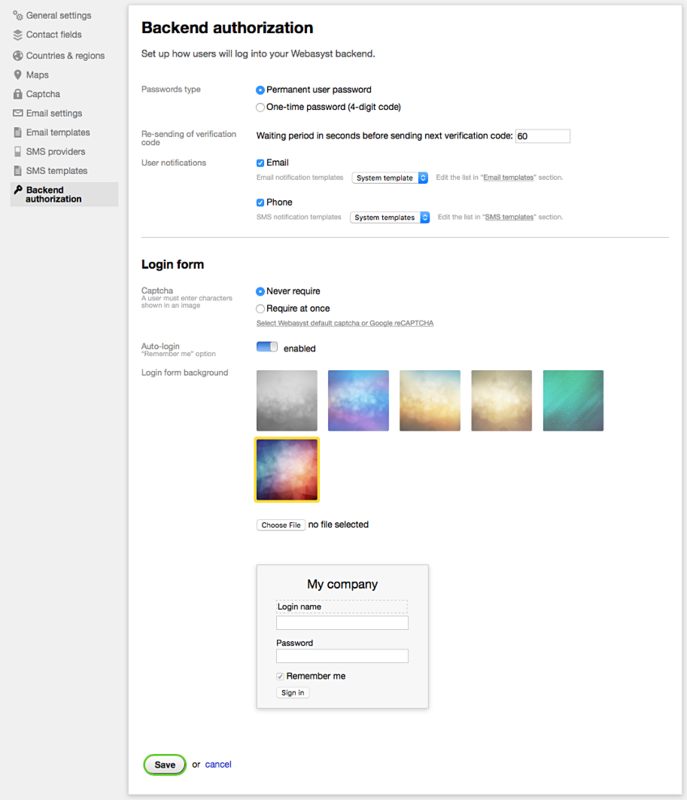 Login form background: select one of available background images or upload your own.